Meet your new go to pair of ankle boots! 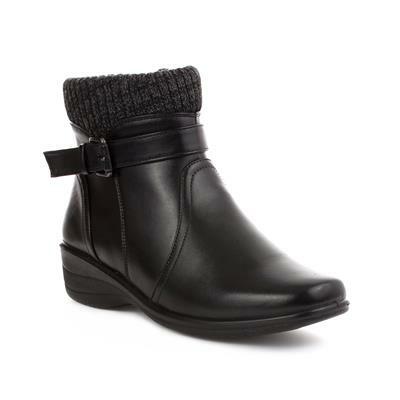 From Softlites, these womens black buckle detail ankle boots are perfect during those colder months as they showcase a round toe, fine stitch detailing, a small yet comfortable heel height, silver buckle details, fine stitch detailing, zip fastening and a knitted trim at the top of the boots. Pair these with your everyday staples for a more casual/relaxed look or pair with tights and a dress if you're after a more formal appearance. These boots look lovely and when I first put them on I thought they fit splendidly, however after walking around in them for the afternoon, my right toe was beginning to hurt a bit - I do have a rather long big toe - so I have stuffed the toe end with lots of paper and will leave them a couple of days before wearing them again. I expect they will be fine then. Well made, good value for money. Good website, and click and collect so easy. The staff in Connswater shoezone are very friendly and efficient. .
Lovely boots, light and comfortable to wear.